Backups...backups...backups... So critical, yet so difficult to be 100% confident. Simple answer is there is no one solution that will guarantee your data's safety. Storing your data using RAID mirroring will help avoid annoyances of hard drives dying horribly at the wrong moment, but this doesn't give you any protection against fat fingers and removing a whole directory by accident. In fact my 3 year old daughter deleted a whole folder of music from a share on my NAS by accident just my leaning on the keyboard, yikes! In my quest to enable simple file folder backups of data held on my NAS to give me an off-site backup, I still find the easiest solution is to copy it all to an external hard drive and hike it over to a friends house. 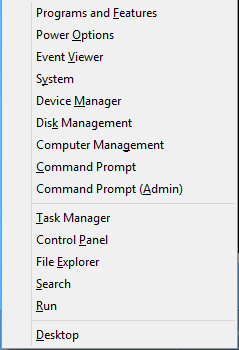 Now that everything is relocated within Windows 8 and a little bit harder to find at first, pressing the X key while holding down the Windows key brings up one of the more useful menus. Windows 8 Start Menu - Replace it with the best of both worlds! After using Windows 8 for a few months now, I still feel the main start menu replacement is a little full-on and isn't as discrete as it could be. I suggest you try out Classic Shell. Unlike some other start menu replacements for Windows 8, it's free, and you can easily still get to the built in Windows 8 start screen by pressing Shift with the Windows key. Completely configurable, definitely worth a try, especially given the price. For the last week I noticed that the "Skype Home" tab that comes up in the main Skype interface (5.10.32.116) was just showing the rotating loading circle. Turns out that this is a problem with Internet Explorer settings and resetting them fixes the problem. Go into Internet Properties within Internet Explorer and go to the "Advanced" tab. At the bottom is a "Reset..." button. Click that and reset your settings back to defaults. Quit Internet Explorer.If running, quit Skype.Start Skype again and all should be well. I've used this really handy website for many years now to find other pieces of software out there that do a similar job to something I've already got. A great way to find software that could be preferable to a tool you already use.